I so don’t want to trick you. I don’t even want to tell you that this is strawberry summer spa water, because I’m pretttty sure there is a brand of rosé called summer water (spoiler alert! Google told me that there is.) and sadly, there is no rosé in this. No rosé for us! But drinking it might make you feel a leeeeettle bit closer to a spa. I mean, I’ve only been to a spa once, but I like to pretend that I go all the time, me and my fancy spa water and what not. When really, it’s just me and my spa water on my couch hoping that in virtual reality, Joey and Pacey, Rachel and Ross, Felicity and Ben and Zack and Kelly are all still together. VERY IMPORTANT THINGS GOING ON IN MY LIFE. Seriously though, one of the reasons that I love this version of water is because it sort of reminds me of my Pimm’s Cup! Otherwise known as, one of the best summer drinks ever. And certainly when consumed by the pool. I’ve never really understood all the talk about missing wine and cocktails during pregnancy. Sure, I sometimes wish I could have a margarita with my tacos or chips and salsa, but I’d much rather be pregnant than be able to have wine for nine months, you know? It’s such a short period in my life that I don’t really even think about it… at least I didn’t last time. When I was pregnant with Max, I didn’t really miss one drop of a cocktail at all. Barely crossed my mind. And I was SO thirsty for weeks after having him that the thought of dehydrating myself further was like, um, no thanks. But! I have to say that during this pregnancy and these early summer months, I have been wishing I could have a glass of super ice cold rosé on our patio. Especially last night when I saw lightning bugs for the first time! Dreamy. Well. That’s got to stop. Maybe come September! Yield: 1 makes as much as you'd like! lots of fresh water or sparkling! Add all ingredients in a large pitcher and fill it up to the top with water. I love this a few hours after it sits in the fridge and the strawberry flavor is delish! P.S. once this sits in the fridge for a bit it turns an adorable shade of pink. this sounds so refreshing! Perfect for hot summer days! These pictures are stunning and I love this simple idea for making a glass of water feel special! This looks so refreshing! 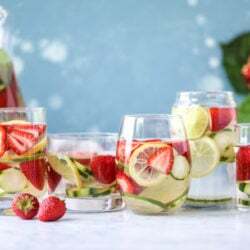 I love fruit infused water! Pingback: Sunday Things... 6.18.17 + Happy Father's Day! I definitely just pinned this! How long do you think it would keep in fridge? Looks delish!